ECB to freeze level of emergency loans available for Greek banks at Friday’s level. Greece will keep its banks closed on Monday in a bid to prevent its banking system from collapsing, a bank official said, after the European Central Bank moved to cap the amount of emergency loans it provides for the country’s cash-strapped lenders. 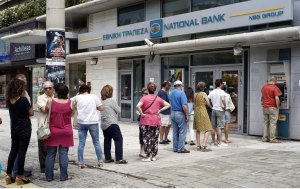 The ECB said earlier on Sunday that it wouldn’t increase the lifeline of emergency liquidity that has been sustaining Greece’s banks, even as nervous Greek depositors appeared to withdraw their money at a greater pace over the weekend. Greece’s move to avert the threat of a bank run comes amid a dramatic escalation of the country’s debt crisis after Greek Prime Minister Alexis Tsipras surprised European policy makers Friday by calling a Greek referendum on whether to accept the terms of the country’s creditors to unlock badly needed financial aid.